Nothing says summer quite like the State Fair! 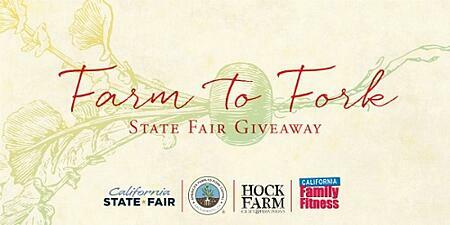 Now through July 10th, you can enter to win a Farm to Fork Family Four Pack including: 4 tickets to the State Fair, parking passes, 4 midway passes, a 3 month family membership to California Family Fitness, and a BONUS $150 gift card to one of Sacramento’s best Farm to Fork restaurants, Hock Farm. Don’t miss this awesome prize pack!